The current temporary exhibit at LMU’s Abraham Lincoln Library and Museum covers the history of Lincoln on film. Abraham Lincoln and his era have long been popular subjects for filmmakers, and two major productions about Lincoln are slated for upcoming release. We asked ALLM Curator and Assistant Director Steven M. Wilson a few questions about the exhibit and the history of Lincoln in the cinema. In addition to his work as a public historian, Wilson writes historical fiction; his novels include Voyage of the Gray Wolves, Armada, and President Lincoln’s Spy. Why an exhibit about Lincoln on film? Abraham Lincoln is an icon in popular culture and has been interpreted in films, stage, and television virtually since his death. Movies are a big part of American society. It seemed appropriate. How do you go about doing the research for a project like this? It helps to have a working knowledge of American movies. The stars, directors, composers, and writers who created these movies were actually employees of huge movie factories. There are countless on-line sites (such as Internet Movie Database) that provide an excellent starting point to begin an investigation of the Lincoln films. What are some items visitors can expect to see? Abe Lincoln in Illinois held its southern premiere on the campus of Lincoln Memorial University in 1940. Besides a shooting script signed by the principals, the exhibit features dozens of photographs of the premiere ceremonies and stills from the movie. We also wanted to expand our investigation to include the wide variety of interpretations Lincoln underwent through the years. The first, of course, is President Abraham Lincoln in D. W. Griffith’s Birth of a Nation. This inflammatory films that paints the newly formed Ku Klux Klan as the avenging instrument of justice. Lincoln’s death at the hands of the heroic John Wilkes Booth is laudable and necessary. The exhibit also has excerpts from Lincoln commercials, television shows, comedy skits, and cartoons. We seem to be seeing a resurgence of interest in Lincoln on the silver screen, with projects like The Conspirator, Spielberg’s upcoming movie and Abraham Lincoln: Vampire Hunter. Why has Lincoln been such a popular subject when it comes to making movies? Good drama is based on loss, personal triumph, a struggle of good versus evil, and validation. Lincoln’s personality is so well-defined, and so apparent (not necessarily accurately), that’s it’s possible to tell his story in whatever permutation for a large audience. Draw a picture of a top hat and beard and you have instant recognition of Lincoln. Talk about the dual themes of tragedy and conflict on a monumental scale, and you have the Civil War. It is a field that has been plowed many times, but it never fails to yield a compelling story. On balance, how accurately do you think Hollywood has treated Lincoln and his era? Have Lincoln movies contributed anything positive to public understanding of the man or of history in general? Like any mythical, iconic, or historical figure Lincoln has had to endure his share of Hollywood poetic license. The artist as director or scriptwriter has a vision, and is not averse to trampling history to get at it. John Ford, director of Young Mr. Lincoln, is a celluloid Frederick Remington—painting the American historical landscape with an unapologetic varnish of pure Americana. His Lincoln is poetic, humble, brave, troubled, but inherently American through and through. Watch any of these films for their entertainment value only. Do you have any personal favorites when it comes to onscreen portrayals of Lincoln? It’s a toss-up between Raymond Massey, Sam Waterston, and Henry Fonda. They all bring qualities of interpretation to Lincoln that enhance the viewer’s experience. I guess my sentimental favorite is Henry Fonda, mostly because I’m an unabashed fan of John Ford. Finally, here’s an irreverent question. What’s the most bizarre or inaccurate Lincoln-related movie you encountered while working on this exhibit? The Lincoln Conspiracy by Sun International is probably the most ridiculous entry in the Lincoln cinematic field. Falling back on the Otto Eisenschiml theory of Stanton’s role in the assassination of Lincoln, the only thing this turkey lacked was ancient aliens, Nostradamus, and gravy. The pair of opera glasses used by Lincoln on the night of his assassination will go up for auction next week, and may sell for anywhere between half a million to three-quarters of a million dollars. This is the first of what will hopefully be an occasional series of interviews with notable Lincoln scholars here at the Institute blog. Dr. William C. Harris, Professor Emeritus of History at North Carolina State University, is co-winner of this year’s Gilder Lehrman Lincoln Prize for his book Lincoln and the Border States: Preserving the Union. 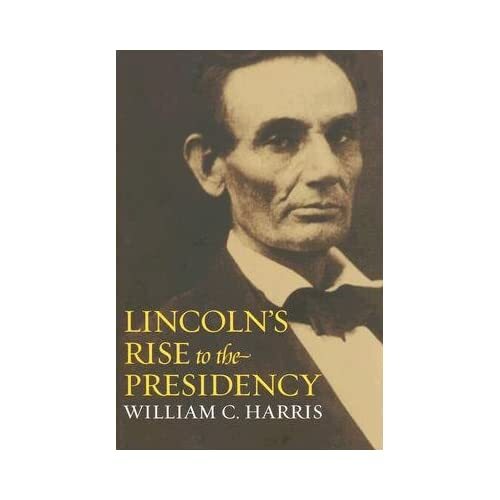 A prolific scholar, he has published a number of other books on Lincoln and the Civil War, including With Charity for All: Lincoln and the Restoration of the Union, Lincoln’s Last Months, and Lincoln’s Rise to the Presidency. He was kind enough to answer some questions about his work. How did you get interested in Lincoln and the Civil War? After serving in the U. S. Air Force, I entered graduate school at the University of Alabama in 1958. My intention was to study Latin American history. However, I took a course with Thomas B. Alexander, a leading authority on the antebellum southern Whig party and also Reconstruction and an exceptional and caring professor. Under his direction, I became keenly interested in the Civil War era and focused my graduate studies and subsequent work on it. My M.A. thesis on Leroy Pope Walker, Davis’s first secretary of war, as revised was published in the Confederate Centennial Series fifty years ago this summer. My doctoral dissertation was on Presidential Reconstruction in Mississippi, which was published by the LSU Press in 1967. It was followed by a comprehensive (large) account of Republican Reconstruction in that state. Later I studied and wrote a biography of William Wood Holden, the controversial North Carolina editor-politician of the Civil War era. While working on Holden, I became interested in Lincoln’s failed effort to establish a Union government in eastern North Carolina in 1862-1863. This led me to realize that, except for William B. Hesseltine’s small and dated Lincoln’s Plan of Reconstruction, there was no study focusing on Lincoln’s efforts to jump-start reconstruction, or “restoration” as he preferred, in the southern states or parts of states under Union military control. 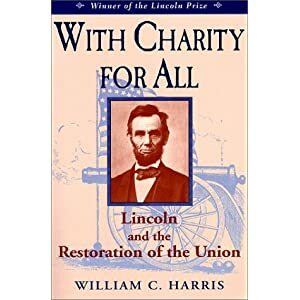 With the publication of this book, subtitled With Charity for All, I became hooked on Lincoln, finding topics that, I believed, needed new studies. Altogether, I have been fortunate to have had four books published on the Lincoln theme, all of which have won some sort of award. In With Charity for All, you argue that Lincoln took a fundamentally mild approach toward reintegrating the Confederate states back into the Union. Why do you think he took this approach? From the beginning of the war, Lincoln insisted that the southern states had never left the Union. He also feared anarchy if these states were not restored to their “proper, practical relations” with the other states in the Union. It was his constitutional duty, he believed, to restore republican forms of government in these states, which meant loyal governments but otherwise without dictation from Washington. In his Proclamation of Amnesty and Reconstruction, December 8, 1863, Lincoln added emancipation to his requirement. Lincoln favored a large measure of self-reconstruction, a position that owed a great deal to the nineteenth-century American commitment to local self-government as the cornerstone of republicanism and the nation’s federal system of government established by the Founders. The restored southern governments, he concluded, should be in the hands at first of a nucleus of local and state Union leaders, who would be willing as soon as possible to expand the body politic to include former rebels. The sooner that the restoration of civil government occurred in the South, Lincoln believed the least southern resistance to the Union and the least bitterness would occur. As Lincoln announced in his annual message to Congress on December 3, 1861, “I have been anxious and careful that the inevitable conflict for” suppressing the rebellion “shall not degenerate into a violent and remorseless revolutionary struggle.” Although a hard war ensued and Lincoln moved toward ending slavery, he did not abandon his stated purpose to avoid revolutionizing the South. Do you think Lincoln’s policy of emancipation, and the remarks he made before his death regarding steps toward citizenship for the freedmen, contradicted his generally mild attitude toward Reconstruction? Did he consider the fate of the freedmen and the fate of the former Confederates to be separate issues? Lincoln’s main concern was ending the war and ending slavery. He had great faith that the Union governments created in the South would extend the protection of the laws to blacks in freedom, though it is questionable whether he would intervene with federal power to demand it. Lincoln, as already mentioned, did require in his 1863 Proclamation of Amnesty and Reconstruction that the restored state governments emancipate the slaves. In his often-quoted last address on April 11, 1865, on Reconstruction, Lincoln indicated that he approved the work of the Louisiana Union convention, and “what has been said of Louisiana will apply generally” to other southern states. He reminded his audience that the Louisiana convention had abolished slavery, “giving the benefit of public schools equally to black and white, and empowering the Legislature to confer the elective franchise upon the colored man.” He declared that he would prefer that the right to vote be extended to “very intelligent blacks” and those who had served in the army, but he said nothing then, or earlier, suggesting he would impose it upon any state. The Louisiana Union legislature, consisting of whites, some of whom were Republicans, made no significant effort to enfranchise blacks. In his April 11 address, Lincoln also remarked that “it may be my duty to make some new announcement to the people of the South.” This address was delivered on the week of Lee’s surrender but before that of Joseph E. Johnston and other Confederate generals. Lincoln was dealing also with the reality of ending the war, not just reconstruction. In his last cabinet meeting, on the day of his assassination, Lincoln asked his cabinet to plan for the transition from war to peace in the South, not the control of the Union governments that would be established. We can only speculate on what he might have done after the war when the Union governments and black freedom were threatened by returning Confederates. Whatever action was taken, he would have managed affairs—and Congress—a lot better than his successor, Andrew Johnson. In 2004 you published a book about Lincoln’s last months in office. Why did you focus on the period of his life? In my work on Lincoln’s reconstruction efforts, I discovered, at least to my own satisfaction, that several topics on Lincoln, beginning with the election of 1864, should be revisited and in some cases with research in primary materials that had not been adequately used—for example, the incoming correspondence and other documents in the Lincoln Papers in the Library of Congress, as well as the printed Collected Works of Lincoln and newspapers. Lincoln’s handling of the crises with Britain over Confederate operations out of Canada and the French presence in Mexico were important topics that I explored. My study of Lincoln and trade through the lines revealed new information on his conduct of southern affairs. Lincoln’s effort to end the war soon in negotiations with Confederate commissioners at Hampton Roads and his strange proposal of compensated emancipation I found interesting and in need of further analysis. His conduct of affairs during his last nine months, including those relating to the Plains Indians and appointments to office, revealed a great deal to me how he might have managed the government had he lived to serve out his term of office. Given your research into Lincoln’s Reconstruction policies and his last days, would you care to offer any speculation as to what might have happened if he had lived to complete his second term? Of course, historians do not speculate on what might have been! Having said that, I will proceed to ignore the rule and speculate. After the war, Lincoln, I believe, would have insisted that only bonafide Union men, or at least those who had ceased to support the rebellion before the end of the conflict, could hold office until loyalty had been clearly established. Their civil rights and property (except, of course, property in slaves) would be restored after their taking an oath of future loyalty. Former Confederate leaders, however, would be required to wait for a time before regaining their full political rights. Southerners would not have been confused as to what was expected of them, as they were under Johnson. They would have early accepted the new reality. Yet, Lincoln would not have attempted to reorder southern society or dictate to Union authorities what southerners should do regarding black rights. However, I believe that he would require them to provide public education, as he outlined in his Reconstruction proclamation of 1863, and equal treatment under the law for the freedpeople. This begs the question: would the Fourteenth Amendment been proposed as necessary to achieve these rights, particularly in view of having to receive a two-thirds vote in Congress and three-fourths of the states for approval. After all, this amendment only succeeded because of President Johnson’s obstructionist policies and in permitting a premature return of former Confederates to power and their adoption of the highly discriminatory laws against blacks (the notorious Black Codes. Lincoln’s political skill probably would have insured his continued mastery of affairs. Moving back in time with regard to Lincoln’s life and forward in time with regard to your books, you followed your study of Lincoln’s last days with Lincoln’s Rise to the Presidency in 2007. In that book, Lincoln comes across as a pretty conservative political thinker. Do you think historians have overstated the degree to which his political beliefs evolved in the 1850s? The Kansas-Nebraska Bill in 1854, introduced by Senator Douglas, which made possible the expansion of slavery into the territories, aroused Lincoln’s moral opposition to slavery, and, though he remained a Whig for two more years, he emerged quickly as the leaders of an anti-Nebraska or antislavery coalition in Illinois, which became the Republican Party. On constitutional and political grounds, Lincoln denied the right of the federal government or the northern states to interfere with slavery where it existed—in the states. On the same grounds, he supported the Fugitive Slave Ac t of 1850, which was a bitter pill for abolitionists to swallow and also other antislavery advocates . He believed that his position was a winnable antislavery platform, though he failed to defeat Douglas on it in the 1858 U. S. Senate election; later it succeeded. Lincoln’s position was therefore a conservative one on slavery. Most historians now classify him as a “moderate”; however, no apparent political designation attached to the word moderate at the time. Lincoln referred to his position as “conservative,” despite his House Divided Speech in 1858, which he insisted was no threat to slavery in the South. The intensity of his antislavery sentiments did not appreciably change after 1854. I believe that Michael Burlingame, Lincoln’s leading biographer, agrees with me on this issue. Did Lincoln’s pre-presidential political experience prepare him for the office, or did he grow into it because of his own innate abilities? He grew to some extent in the office; most presidents do so. However, it should be remembered that his long experience as a minority party leader in Illinois, where political skill was necessary to win elections, had prepared him well for the difficult task of managing the critical political situations that he faced as president. On the other hand, his lack of military experience, except briefly in the Black Hawk War, necessitated that he learn quickly the arts of war. His innate abilities served him well over time as commander in chief of the armies. Like few other presidents, Lincoln, based on his earlier experience, keenly understood as president that politics was mainly state and local politics, and state leaders and factions must be carefully cultivated and carry the torch for the party in the elections. He developed a knack for the right timing of his actions (for example, his Emancipation Proclamation), and he also practiced his belief that promises must be kept and disputes resolved. Despite the modern belief about his speech-making ability, Lincoln’s rhetoric was relatively unimportant in rallying the North behind the Union and the war. From his Illinois experience, he understood the need to balance political forces, and thereby maintain support for his objectives in the war. These were preserving the Union and ultimately ending slavery. His innate intelligence, of course, predated his presidency. Your latest project is a study of Lincoln and the border states. Lincoln believed “to lose Kentucky is nearly the same as to lose the whole game.” Why was preventing the secession of his home state and the other loyal slave states so important? How did he manage to keep these border states in the Union? The border states, strategically located between the free states of the North and the Confederate States, contained one-third of the white population of the South. They also contained three important industrial centers (Saint Louis, Louisville, and Baltimore). The retention of the border states in the Union was absolutely necessary to the suppression of the rebellion. Most whites in the border states in 1860-1861 identified themselves as southerners because of their support of slavery. They defended “the peculiar institution” as important economically and as essential to social stability and race control. They vehemently opposed Lincoln and the “Black Republicans” out of fear that the new government in Washington posed a threat to their society. Lincoln understood that he must accommodate the political and racial realities in the border states in order to maintain the loyalty of the people, provided hostile factions in these states did not threaten secession or undermine the war effort. In the beginning of the war, Lincoln in order to retain Kentucky in the Union even acquiesced in the state’s proclamation of neutrality. He respected the states’ rights of Missouri and Maryland, though he suspended the writ of habeas corpus in Maryland after the Baltimore rioting in April 1861. Lincoln also authorized the arrests of southern rights legislators in Maryland southern rights legislators when, he thought with some justification, they were plotting to take the Old Line State out of the Union. Lincoln also faced bitter opposition in his own party for his border state policy and particularly his tolerance of Kentucky’s neutrality. Actually, he believed that neutrality in the war was virtually equivalent to rebellion, but he accepted Kentucky’s action as a temporary necessity until the state was safe for the Union. “Kentucky gone,” he famously and correctly wrote early in the war, “we can not hold Missouri, nor, as I think, Maryland. These all against us, and the job on our hands is too large for us. We would as well consent to separation at once, including the surrender of the capitol.” Kentucky abandoned its neutrality in September 1861 when the Confederates violated its borders by seizing strategic Columbus, Kentucky, before Union forces did. Although most Kentuckians as well as inhabitants of the other border states remained true to the Union, a minority of their young men (except for Delaware) went south and served in the Confederate army. How important was Lincoln’s desire to secure emancipation in the border states, and what steps did he take to accomplish it? During the first two years of the war, Lincoln believed that a border state decision to end slavery, even gradually which he preferred, would deprive the rebels of the expectation that these states would join them in the war. Such action by the border states, Lincoln argued, would dash the hopes of Confederates for independence, and they would cease their rebellion. Lincoln firmly believed in the immorality of slavery and wanted it destroyed. However, he could not find a constitutional basis to force emancipation upon the border states, since they remained loyal to the Union. In 1862, he asked these states voluntarily to approve a plan of gradual and federal compensated emancipation. He lectured the states’ representatives in Congress on the necessity for their states to agree to his proposal. Not one of the border states, including tiny Delaware with only 1,800 slaves, accepted the plan. There was also the border state argument that Congress would not appropriate the money to compensate the slaveholders. Even after he issued his Emancipation Proclamation on January 1, 1863, on the constitutional grounds of military necessity to win the war, Lincoln still sought border-state action to end slavery. Gradually, many border state Unionists saw the handwriting on the wall for slavery and, perhaps to be able to control race relations after the war, moved to end slavery. During the last months of the war, Maryland and Missouri adopted amendments to their constitutions freeing the slaves in their states, without compensation. The last slaves in Kentucky and Delaware, however, were not freed until the ratification of the Thirteenth Amendment in December 1865. Finally, since the Institute is concerned with drawing on knowledge about Lincoln to improve leadership and public policy today, are there any lessons you think modern Americans can learn from Lincoln? Because of the vast changes in communication, the growth of governments at all levels, and the demands on political leaders for immediate solutions, it is difficult to draw lessons from Lincoln’s conduct of wartime affairs that would work today. However, a few points could be drawn from the Lincoln example. A man of humane sensitivities, Lincoln demonstrated that skillful and honest leadership is the central ingredient for success, whether engaged in a major war or attempting to resolve problems and balance conflicting factions during peace time. Although not perfect in his exercise of affairs, Lincoln understood the political realities of his time, and he exercised patience, restraint, and good judgment in dealing with the problems he faced. He also carefully weighed the repercussions of his policies, and usually acted accordingly. He kept his promises regarding his position on issues, a commitment sadly lacking in today’s leaders. When confronted by those who opposed his policies, he often reminded them of his promises, and that he was being consistent. He rarely questioned the motives of his opponents, only their conduct and positions on issues. Even Lincoln’s opponents found little fault with his character; they acknowledged that he was honest. Unlike what we expect of presidents and other political leaders of today, Lincoln, as Douglas Wilson has brilliantly demonstrated, was extremely careful in what he said in public lest he be misunderstood and his statements distorted and used against him. For that reason, and despite his reputation for oratory (notably the Gettysburg Address and Second Inaugural Address), he made few speeches. Our presidents of today would be well advised to follow this example at times. Lincoln’s often insistence on confidentiality in his communications and meetings, though probably desirable before decisions were made, would not fare well in today’s public demand for openness in the government. Lincoln’s frequent resort to anecdotes and quips in order to illustrate a point or deflect the demands of a group or individuals also would not set well with the American public today, particularly in the face of an aggressive media’s questioning. In other words, Lincoln would have a hard time leading from “the bully pulpit.” Finally, Lincoln respected the federal system of government contained in the Constitution, which twentieth-first century political leaders, judges, and media pundits could profit by noting. Lincoln Memorial University’s (LMU) Abraham Lincoln Library and Museum (ALLM) will present a Civil War symposium entitled “War in the Mountains II” on Saturday, April 21, 2012. The event is part of the institution’s ongoing commemoration of the sesquicentennial of the American Civil War. Inscoe has taught southern history at the University of Georgia for over 25 years. A native of western North Carolina, much of his research and writing has focused on nineteenth-century southern Appalachia, specifically on the issues of slavery, race and the Civil War. He is the author of Mountain Masters: Slavery and the Sectional Crisis in Western North Carolina; Race, War, and Remembrance in the Appalachian South; and co-author of The Heart of Confederate Appalachia: The Civil War in Western North Carolina. He has edited or co-edited volumes on Georgia race relations, Appalachians and race in the 19th century, southern Unionists during the Civil War and a volume on Confederate nationalism and identity, produced as a tribute to Emory Thomas. He recently completed a book entitled Writing the South through the Self: Explorations in Southern Autobiography. Hess holds the Stewart W. McClelland Chair in History at LMU, where he has taught since 1989. He completed his B.A. and M.A. degrees in history at Southeast Missouri State University. His Ph.D. in American Studies, with a concentration in history, was awarded by Purdue University in 1986. Hess has taught at a number of institutions, including the University of Georgia, Texas Tech University and the University of Arkansas. He is the author of more than a dozen books on Civil War military history, the latest of which is Into the Crater – The Mine Attack at Petersburg. The University of Tennessee Press has published his latest work, an engaging history of the University entitled Lincoln Memorial University and the Shaping of Appalachia (UT Press, $45). Hess was nominated for a Pulitzer Prize in 2002. More information on books written by Hess can be found at http://www.love-and-learning.info. Nash is a post doctorate fellow at ETSU. He earned a bachelor’s degree at The Pennsylvania State University, a master’s from Western Carolina University and a Ph.D. from the University of Georgia. Nash’s areas of interest include the 19th Century United States, the Civil War and reconstruction, Appalachia and environmental history. The symposium will run from 9 a.m. to 3 p.m. with two breaks. The event is open to the public. It is free to LMU faculty, staff and students. Students from other colleges and universities will receive a 50% discount off the $30 registration fee. Civil War-related books will be available for purchase at the event. For more information or to pre-register contact Director of Programs Carol Campbell at 423.869.6439 or by email at carol.campbell@lmunet.edu. A story in today’s Chicago Sun-Times raises questions about one of the most iconic artifacts at the Abraham Lincoln Presidential Library and Museum in Springfield, IL. The provenance of a stovepipe hat which reportedly belonged to Abraham Lincoln is in doubt. The problem is that nobody can document William Waller’s presence in Washington, D.C. during the period in question. It’s possible that Lincoln may have given him the hat at some earlier point, perhaps in 1858. Lincoln Memorial University’s (LMU) Abraham Lincoln Library and Museum (ALLM) will welcome Kentucky Historical Society Professional Services Specialist Warren Greer as the keynote speaker at the University’s annual commemoration of President Lincoln’s death, “Now He Belongs to the Ages” on Friday, April 13. The commemoration will be held on LMU’s Quadrangle at 10 a.m., as part of the University’s observation of the Civil War Sesquicentennial. In the event of bad weather, it will be moved to the Arnold Auditorium inside the ALLM. “Now He Belongs to the Ages” provides an opportunity for the community to honor President Lincoln’s life and commemorate his untimely death. LMU Professor of English Elizabeth Lamont will recite Lincoln poetry by Walt Whitman and Carl Sandburg. The program will also include the musical talent of Dr. Conny Ottway. For more information, contact Carol Campbell, director of programs, at 423-869-6439 or via email at carol.campbell@lmunet.edu. The event is free and open to the public. Click here to read a short summary of the bizarre adventures of Lincoln’s corpse, from its trip to Springfield in 1865 to an elaborate reburial in the twentieth century.